Contact or visit us to learn more about our A+ rating with the BBB and see more examples of our work. 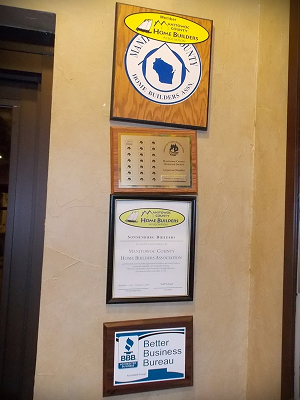 Sonnenburg Builders has proudly served homeowners living throughout Manitowoc County since 1986. Our work is on display in communities from Mishicot to Long Lake. We specialize in kitchen and bathroom remodeling, home independence solutions and bathroom remodeling for seniors and the disabled, safety grab bar installation, new room or new storey additions and new home construction. We also finish basements and attics, adding functional living space while also reducing your home’s heating and cooling costs. Our home improvment specialists can recommend the best replacement windows and doors for any room of your house, reducing noise and improving security. We also offer cost-effective handyman repair services for homeowners and apartment managers, no job too big or too small! We control our costs without taking lazy shortcuts, which means we’ll stay within your budget without ever sacrificing quality. It’s this dedication to our customers’ needs which has earned Sonnenburg Builders an A+ rating from the Better Business Bureau. Sonnenburg Builders works closely with you, planning every aspect of your kitchen, bathroom, garage, patio or bedroom remodeling. This attention to detail and respect for your timeline and budget allows us to complete small and complex home improvement projects on time and in budget. Don't let fear of out of control home remodeling costs keep you from creating the home of your dreams. Contact us today using the form above or just give us a call! Read testimonials and find out why homeowners throughout Manitowoc and the surrounding communities trust Sonnenburg Builders with all of their home renovation and remodeling projects. You can also contact us to ask for more references and we'll gladly share more about the projects and happy homeowners we've worked with over the decades. Our Manitowoc home remodeling showroom has running water so you can see and test new bathroom and kitchen fixtures before deciding. We also have several walk-in showers on display as well as a tub with a swinging door. From windows and roofing materials to stone countertops and quality cabinetry we'll guide you through the process of selecting the best products to complete your kitchen remodel or bathroom renovations within your price range. Check our before and after photos from our completed home remodeling projects or contact us for more examples of our work. We're happy to help you find ideas and inspiration and answer any questions you may have. You can also visit our home remodeling showroom at 2125 N Rapids Rd, just south of Menasha Ave in Manitowoc, to see the value Sonnenburg Builders will add to your home. Contact our Manitowoc home builders today for a remodeling estimate you can rely on!